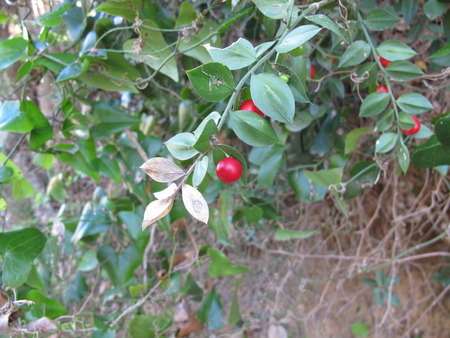 Butcher's broom, or Ruscus aculeatus, is an evergreen like shrub with a long history of use in Europe for promoting circulatory system health. Among other benefits, butcher's broom helps tighten blood vessels and capillaries, which has generated interest for use against varicose veins. It's also been shown to relieve fluid retention and other symptoms of chronic venous insufficiency. According to American University in Washington, DC, butcher's broom activates receptors that stimulate the release of noradrenaline to increase vascular tone and constrict blood vessels. The constriction helps to get the blood moving and reduce pooling. Butcher’s broom contains flavonoids that also support normal circulation and strengthen blood vessels. Varicose veins and hemorrhoids are common and associated with a loss of blood vessel integrity. Thus, supplementing with herbs, such as horse chestnut and butcher's broom, that support the vascular system may help. Butcher's broom is believed to improve both conditions by promoting healthy microcirculation, capillary flow, and strengthening connective tissue. It's even been approved by the German Commission E (Germany's version of the FDA) as a remedy for hemorrhoids and a 1999 clinical trial supported butcher broom's reputation as a hemorrhoid remedy.